Midpoint, Works from University of Maryland College Park 2nd Year MFA Candidates, presents a diverse grouping of artworks by Joseph Hoffman, Timothy Horjus, Sarah Laing, and Stewart Watson. As the exhibition’s name suggests, these artists are at an important crossroads where practice and exploration meet. For this reason, the exhibit is simultaneously investigatory and mature, an indicator of a well-developed MFA show next spring. 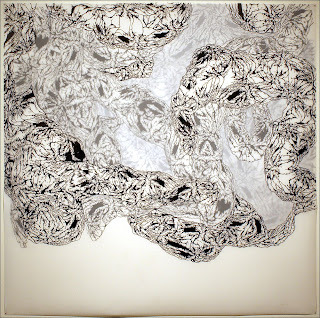 The exhibition is on view at The Stamp Gallery, at the University of Maryland in College Park until June 10, 2009. 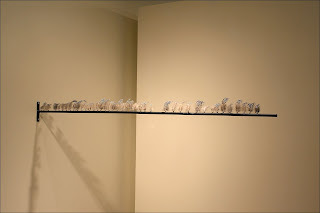 Maryland native, Joseph Hoffman, has exhibited in multiple juried and group exhibitions around the nation. He received his BFA from the University of Dayton, Ohio in 2006. His pieces in Midpoint, while vastly different, are united by their curious nature. One investigates the presence of ambient sounds in our daily lives, while the other explores contextual ironies found on single history book pages. 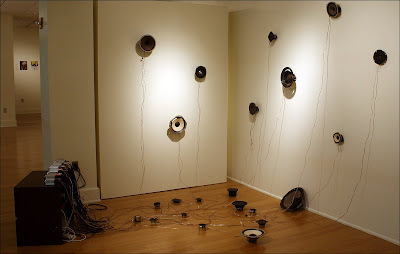 In the lively, sprawling installation, Write Me a Few Lines, Hoffman investigates the numerous, disregarded sounds of our daily environment. A configuration of wires, speakers and an impressive control board produce a sensory experience for the ears and eyes, as different pitches, tones and volumes visually communicate by vibrating exposed speaker heads. 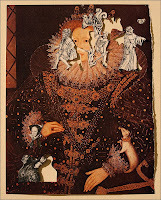 In his series, History of the World, Hoffman presents three unique collages. He carefully cuts out images on one side of a page and folds them to appear on the reverse side of the paper. Two separate contexts combine into a new, perplexing message. Hoffman is able to explore context, assumption and hypocrisy with this relatively simple approach. Stewart Watson is a Baltimore artist whose work has been featured in numerous solo exhibitions and over 60 juried and group shows. She received a BFA degree from Pennsylvania State University in 1991. A delicate intersection of form, material and physical strength are present in Watson’s floor sculpture, Tin Types, Family Portrait. 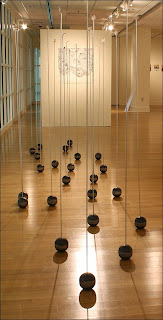 Steel spheres sit on the floor, grouped like a flock of birds. 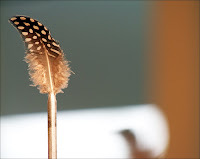 Each one gives rise to a long steel rod, culminating at eye level with a delicate feather at its tip. In Watson’s wall piece, Twice Removed, Harry Smith, a single steel beam protrudes out from the wall. Feathers run it’s length connected with magnetic balls. These pieces successfully combine the delicacy of feathers with the strength of crude steel. Their careful union intensifies each materials’ distinct physical traits. Sarah Laing, a native of Edinburgh, Scotland, received her BFA from the Duncan of Jordanstone School of Art and Design, Dundee in 2006. Her work has been included in several exhibitions throughout Scotland and the United States. She combines drawing, digital manipulation and repeated patterns to form compositions evocative of her interest in genetics and the landscape. 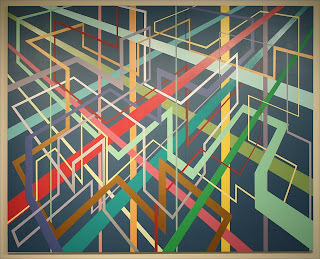 Laing’s pieces, Hollow Pursuits and Turnabout Intruder, use amorphous, twisting, tunneling lines that roam, mingle and meet to build larger organic shapes. 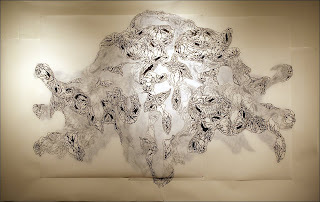 Her mylar layers and digitally manipulated patterns actively separate this work from the well-explored avenue of rambling, linear drawings and wall pieces. 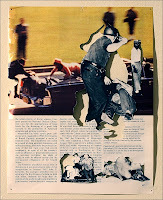 Timothy Horjus is a Kentucky native who lives and works in Baltimore, Maryland. He received his B.A. in Art Education from Trinity Christian College in 2000, and a Post-Baccalaureate Certificate from the Maryland Institute College of Art in 2005. His work has been featured in multiple exhibitions in Maryland and Illinois. Using house paint, tape and canvas, Horjus paints in a highly stylized, formal manner that focuses on straight edges, considerate color relationships and spatial interactions. A strong visual theme pervades his pieces, as strength is garnered through his underlying understanding of design fundamentals and linear perspective. Clear visual references to modernism and post-painterly abstraction are offset by Horjus’s conceptual investigation into the way the internet alters the contemporary human condition. Taken from anonymous subject lines of spam emails, the titles of his three pieces in this show, Think Your Jang Length, Order Against Swine Flu Vaccine and When the Crisis Ends, force new associations on the viewer and clearly link this work with contemporary themes.